Also known as Garlic Mustard, this biennial spring wildflower smells remarkably like garlic when the stems are crushed. 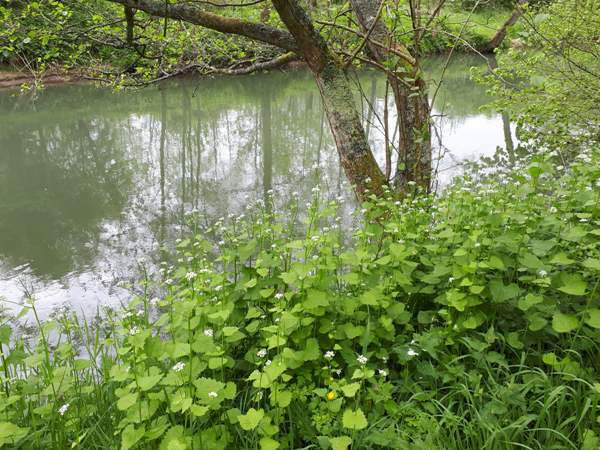 The elongated heart-shaped stalked leaves are 5 to 8cm long (excluding the stalks) and bright yellowish green in early spring, darkening somewhat as the year advances; they are toothed and look like stinging nettles. In their second year the plants grow to 30cm to 120cm tall. 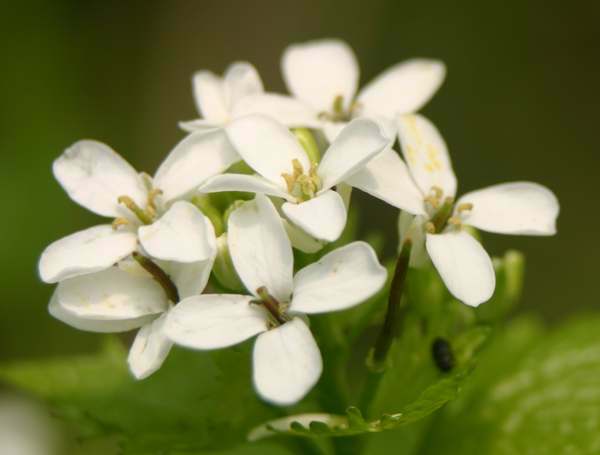 The white flowers appear in small clusters in spring and early summer. As with other members of the Cabbage family (Brassicaceae) each flower has four petals; they are oblong and 4 to 8mm long by 2 to 3mm wide. The fruit (seedpod) is a slender upright four-sided silique some 4 to 5.5cm long and containing two rows of black seeds that are released once the pod dries out and splits open. Alliaria petiolata is widespread and common throughout Britain and Ireland, and is found throughout Mainland Europe and in Africa and India. In North America it is an invasive alien plant. Appropriately named, this is a plant of hedgerows, but in shaded places you will also find it lining the banks of ditches and streams. 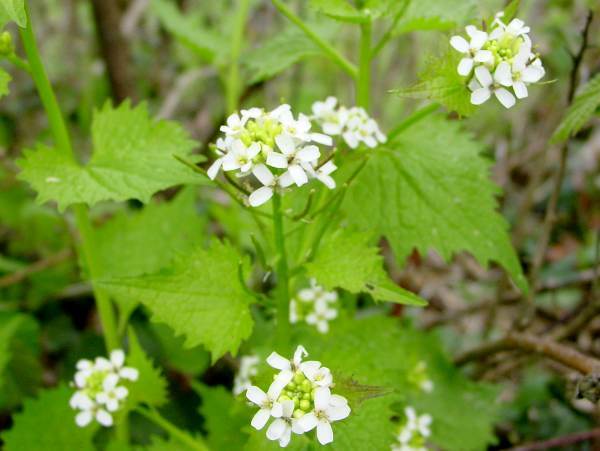 The best of the flowers of Garlic Mustard or Jack-by-the-Hedge appear in April and early May, but you can occasionally find a few blooms right through until August. Jack-by-the-Hedge is edible and, if collected when young, the leaves make an excellent addition to salads, sauces and other dishes. Alliaria, the genus name, means 'of the allium family', and is botanically incorrect; however, as a reference to the odour of these plants it seems quite appropriate. Garlic Mustard often grows beside hedges, which is where its alternative common name Jack-by-the-Hedge says that it belongs! 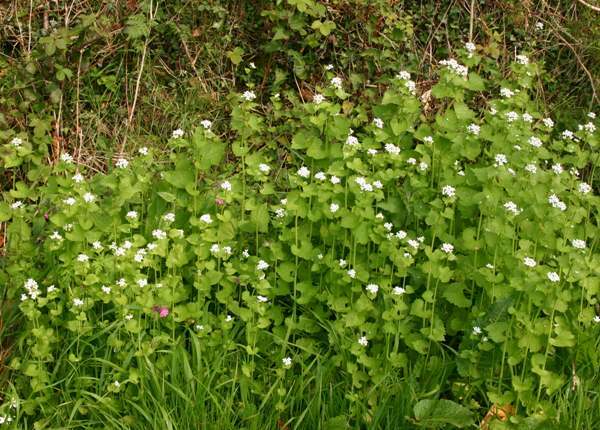 The specific epithet petiolata means having petioles - stalks connecting the leaves to the main stems - as indeed the leaves of Garlic Mustard do.